MANUFACTURER: CCI Spectrum, Jacksonville, Fla.
High levels of hydrogen sulfide had corroded 1/2 to 1 inch of the concrete-brick and precast concrete manholes in Kalamazoo, Mich., causing infiltration as high as 20 gpm. The worst of four targeted offenders had leaks that squirted water like leaking garden hoses. Renaldi was familiar with Advanced Rehabilitation Technology (ART) in Bryan, Ohio, from a presentation on sealing of wet wells using a multicomponent stress skin panel liner system (SpectraShield). After monitoring the atmosphere for gases, Junior Garcia and Josh Kimple from ART prepared the manholes for lining. The steel stairs in three manholes were so corroded that they fell off when hit with a hammer. The fourth manhole had coated steel stairs in good condition. Because the lining extends just below the lid, the men cleaned the flaking, corroded steel castings with a power chisel. 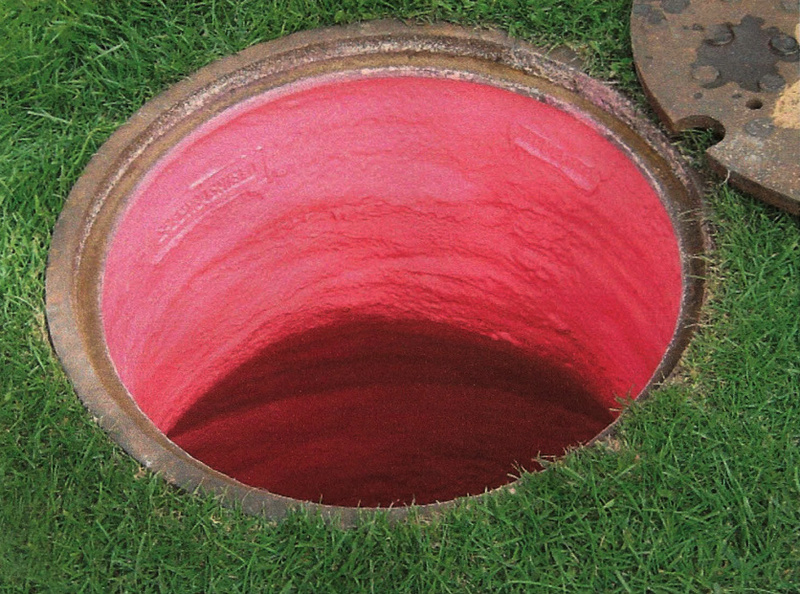 Following OSHA confined-space entry specifications, Garcia entered the 12-foot-deep manholes and jetted the walls with water at 6 gpm/4,000 psi, creating a smooth, clean surface to which the layers of polymer resins could bond. Screens at the bottom of the manholes trapped debris but allowed water to drain away. The city removed the material with its 2100 Series vacuum loading truck from Vactor Manufacturing. To stop severe leaks, Garcia and Kimple drilled into the bricks and injected fast-acting SpectraGrout. They plugged minor leaks with hydraulic cement. To apply the multilayered stress skin system from CCI Spectrum in Jacksonville, Fla., Kimple first sprayed on a coat of silicone-modified polyurea. This moisture barrier provides adhesion to the substrate and dries tack-free in seconds. He then sprayed a layer of tight closed-cell polyurethane foam to fill all voids and restore the surface to its original placement. Kimple followed it with a second coat of silicone-modified polyurea, which provides the final corrosion barrier. The layers combine strength with some flexibility, enabling them to resest failures due to freeze and thaw cycles and ground movement. The system also eliminates the need for separate chimney sealing. “The actual lining took about two hours with minimal disruption,” says Renaldi. 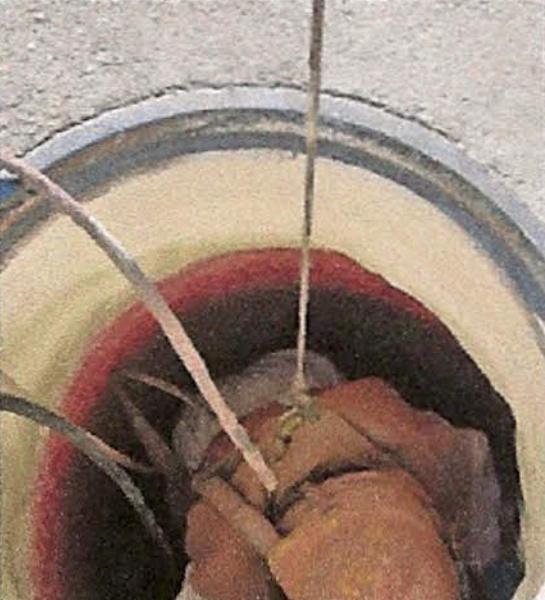 “We returned the lines to service within minutes of the application.” City crews have since identified more manholes for rehabilitation using the SpectraShield lining system. 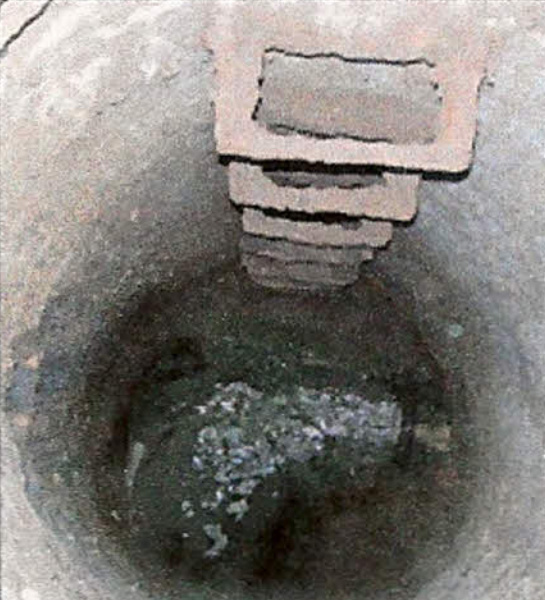 Three manholes had steel stairs so badly corroded that they fell off when hit with a hammer. Note water inflitration. The corrosion barrier was applied by a tachnician fully equipped for confined-space entry.